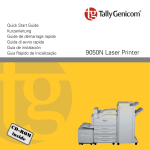 This manual is intended to provide guidance for the proper installation of your printer. A note is a tip or extra information that may be helpful in installing or using the printer. close attention to these sections and read them fully to prevent possible injury. Follow all the operating procedures provided in this manual. can cause injury to yourself or damage to the printer. manual. When in doubt, contact your dealer or service company. beforehand. Be alert and use your common sense. attempt to lift the printer alone. grasping any area other than these recessed areas. a complete electrical disconnection, pull out the main plug. Do not remove the cabinet, operation panel, or any other covers. Throughout this manual, the four sides of the printer are referred to as front, rear, right, and left. respectively, of a person who is facing the front of the printer. Product, is against the authorized dealer from which you purchased the Product. the warranty rights to which you are entitled from the authorized dealer. protect the environment through superior efficiency. cartridges. Be sure to use only SHARP-specified products for the toner cartridges. remain inside the cartridge without flowing out. available for 7 years following the termination of production. Before installing the printer, check that all the items are contained in the package. Should any components be missing or damaged, contact your dealer. printer, observe the following precautions when locating the printer. weight of the printer. If the printer falls over, there is a severe risk of injuries. cause injury if it falls over. Do not subject the printer to direct sunlight or a malfunction may result. otherwise a fire hazard or electric shock may result. Do not place the printer near heaters or similar objects, otherwise a fire hazard may result. will build up and cause a fire hazard. or a fire hazard may result. appropriate clearances when determining a location for your printer. around the printer. Installation of the printer should be carried out by qualified service personnel. as shown on the instructions at the rear of the printer. The small lever to back of the unit is used for an optional part that is not available on this printer. The lever should remain in the down position. Keep the toner cartridge in a location out of reach of children. Do not forcibly open the toner cartridge. finish the installation within 5 minutes. A drum shutter protects the photosensitive drum from light. Do not open the drum shutter. should try to immediately remove it with a vacuum cleaner which has a fine filter. Avoid inhaling possibly escaped toner dust. is raised, push it down. it to the desired paper size. slide it to the desired paper size. paper over the right width guide. step 7. If not, skip to step 8.
not in place, the paper will not be properly fed and may cause a paper jam. 8. Replace the lid of the paper tray. 9. Firmly seat the tray in the printer. position to turn the power on. The printer motors run for 2 or 3 minutes when you first turn the power on. The printer displays a series of messages and then displays READY when it is available for use. While turned on, the printer will go into the standby state if it remains idle for a period of time. period of time, switch off the power. to choose the option. You can use the CANCEL button to exit any current selection. printer. To print a Configuration Summary, press the INFO button on the Operator Panel. the CD-ROM for further help. 1. Load the CD into the drive. the PC in use. If the driver or installer does not support the language in use, it will use English. point the Add Printer Wizard to the appropriate folder on the CD. such as a duplexer will be unavailable until the option is added to the driver’s configuration. 1. From the Windows Control Panel, select Printer and Faxes. This control is named simply Printers on Windows Vista. 2. Find your printer in the list and right-click. 4. Click on the Configuration tab. show None or Installed, except for memory which shows the amount of memory installed. For Auto Configuration, go to step 5. For Manual configuration, go to step 6. 5. Auto Configuration - Click the Auto Configuration button. The driver will automatically configure the available options. Go to step 7. 6. Manual Configuration - Select the option in the list that you wish to change. If the option is memory, select the amount of memory installed. 7. Press OK or Apply. Paper that is smaller than W: 98.4 mm (3.9 in) x L: 148.0 mm (5.8in) must be placed in Tray 1. Thick 3. When using Thick 3, duplex is not available. *** Please contact your local dealer or authorized service representative for additional details. should be 90° F or below at 85% humidity.